As I posted briefly yesterday, the new paper on splashed white had a lot of surprising information, not the least of which was the horse pictured in yesterday’s post. A number of people wondered about his identity, and most particularly about his breed. His name is Apache du Peupe, and he is a four year-old Freiberger. The Freiberger is also called the Franches-Montagne, which sometimes leads to confusion. The horses in the picture above (courtesy of Wikimedia Commons) are quite typical examples. 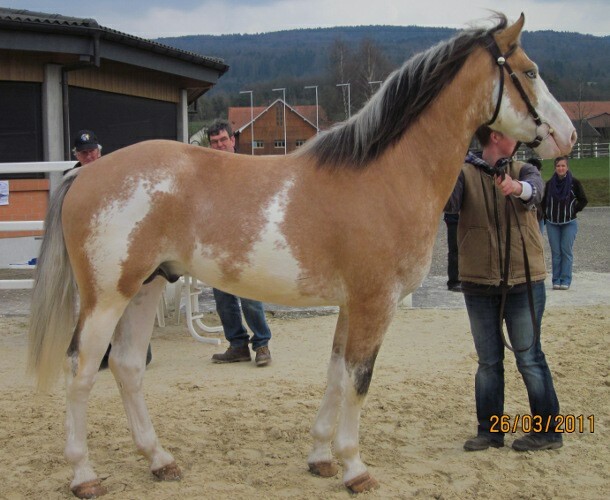 Freibergers are among the last of the European light draft breeds, though in more recent years many breeders have focused on a slightly lighter riding type, which is why I choose to shift them – and a few others, like the Frederiksborg – to a later volume rather than include it in the draft and coaching breeds. Because they were originally included in the upcoming volume, I had looked into the range of colors in the breed. Apache came to my attention during that time. Freibergers were already interesting because they had a well-documented family of dominant whites. 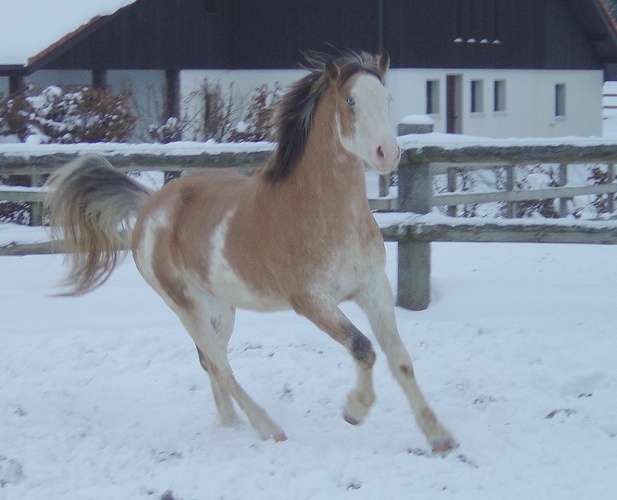 Those trace back to a white mare, Cigale, born in 1957. She was the source of what eventually became the first formally identified dominant white mutation. Hers is the mutation that got the designation W1. That is what I thought Apache was, until I realized that he was not related to Cigale. In fact, his parents did not look all that different in color from the two horses pictured above. This is his sire, Noble Coeur. This is his dam, Muscade. Both are clear bays with socks and minimal face markings. Apache and his parents are the kind of horses that sat in my “don’t fit the theory” file when I first wrote about maximum sabinos (sabino whites) in the 1990s. 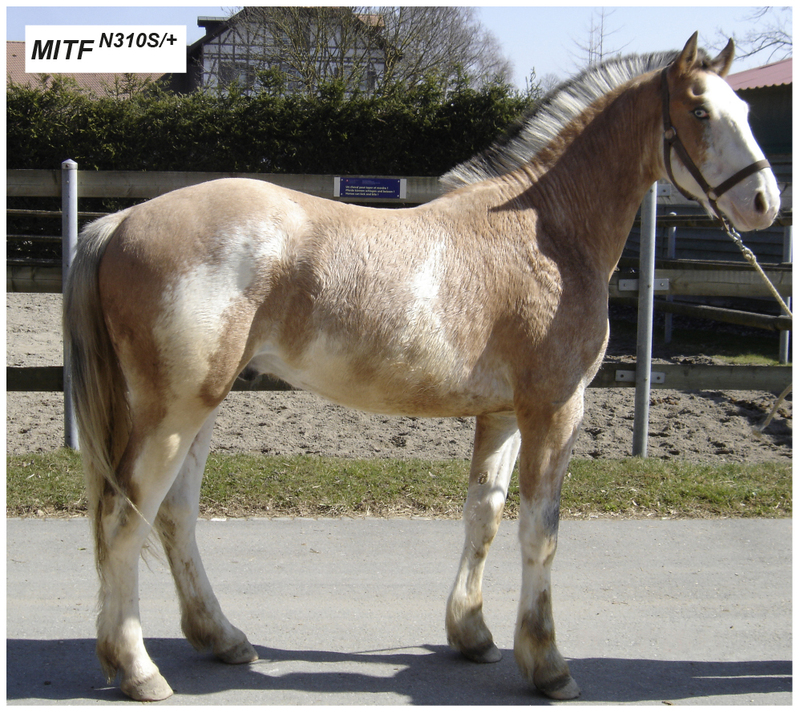 The horses that did fit that theory turned out to be Sabino1, the spotting pattern that results in a white horse when homozygous. All the horses that fit the theory had parents with a high number on my ranking scale for white markings, while most of the horses in the “don’t fit” file had parents that fell short. Typically they did have some white, but it was a stretch to say they were marked like the others. Had Apache and his parents come along at that time, they would have ended up in that same file. Many of the horses there (R Khasper, White Beauty, Puchilingui) were later identified as dominant whites. So I wondered if Apache was another new dominant white mutation. But there was another aspect to him that made me wonder, and that is why – up until yesterday when he appeared in the splashed white paper – he was in my “mystery” files. If you look closely at his picture, he looks diluted. If he were a Paint horse, or almost any other American stock or gaited breed, I would assume he was buckskin. Here are more pictures that give that impression. That was what was so unusual about him. His parents are, as the links show, quite ordinary bays. And even allowing for the fact that he probably has a good portion of white hairs mixed in his coat, the tones give the impression that the actual hair is diluted. His owners called his unusual color “macchiato”, for the coffee drink, which suggested that he was cream-colored in person. Since his parents were not diluted, and since I had no evidence that cream (or any other dilution) was present in the Freiberger, I wondered about the accuracy of his pedigree. Pattern mutations do appear, but a pattern and a dilution all in one horse? And now with the publication of the splashed white paper, we know that is exactly what he has: a mutation that is both a dilution and a white pattern. Researchers parent tested him using 13 markers, confirming that he really was the offspring of the parents of record. What’s more, they tested blood, hair roots and sperm to rule out mosaicism. Mosaics are animals that have two separate sets of cells with different genetic coding. 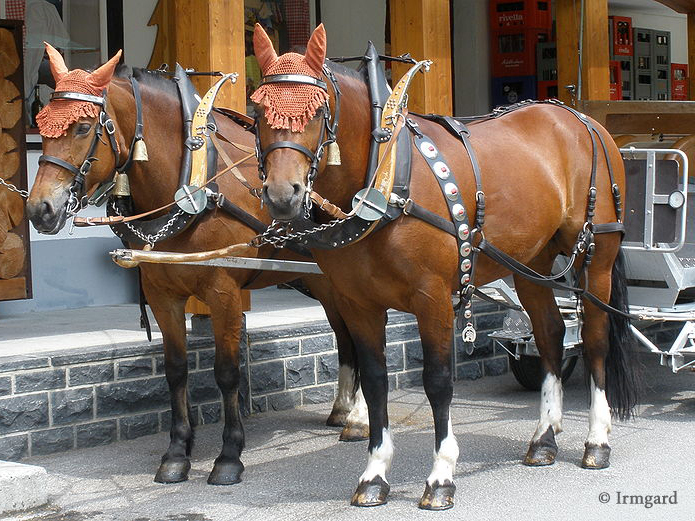 Horses that are patched with black and chestnut, for example, are mosaics. Apache is, genetically speaking, all one horse with the same genetic makeup throughout his body. They also looked at the genes currently known to produce dilutions, and found nothing out of the ordinary. So he’s not a cream, a silver, champagne, pearl or dun. He is what is called a de novo mutation – something new. The new thing that he has is a mutation at the same location as splashed white, which is the MITF gene. The color Apache’s breeders named Macchiato is a form of splashed white. Technically that makes four identified splashed white patterns, although researchers declined to name his SW4, perhaps in deference to what his breeders were already calling the color. So far the other MITF mutation for which we have numerous examples to study, SW1, does not seem to have the diluting component. 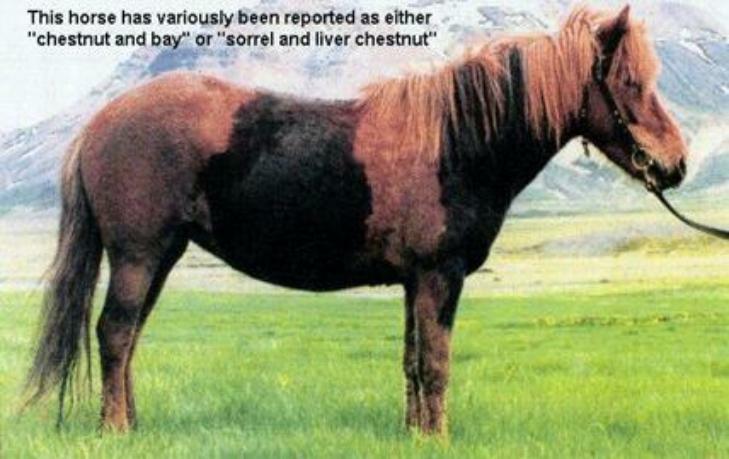 The third, SW3, is said to be rare and none beyond the two horses pictured in the paper have come to light so far. Neither of those two horses appear diluted, but two is not a lot of data, especially when one is too white to really evaluate base color on anyway. Tietz syndrome is a genetic condition characterized by profound hearing loss from birth, fair skin, and light-colored hair. This condition is caused by mutations in the MITF gene. Waardenburg syndrome is a group of genetic conditions that can cause hearing loss and changes in coloring (pigmentation) of the hair, skin, and eyes. So a similar mutation in human beings causes pale hair, piebald patches (in the Waardenburg Syndrome) and pale eyes. It also causes deafness, which was also true for Apache, who tested to be deaf. That raises the question of whether or not other as-yet-unidentified splashed white patterns might not have a dilution component like that seen in Apache. Certainly several of the horses from the Bald Eagle line have a very similar base color to Apache du Peupe. I had assumed that, being stock horses, the were getting their diluted color from the other parent. It would certainly be worth looking at the members of that family to confirm that those with diluted base colors actually had a diluted parent. That isn’t something that ever would have occurred to me to look for, because “dilution” and “white pattern” were completely separate categories of colors up until yesterday. As I said, it is an exciting time to study horse color, because there really is something new to learn all the time! So that’s three of the four mutations. Someone probably noticed that one got skipped. That is SW2, and if Macchiato complicates how we categorize mutations, that one complicates how we are naming them. I’ll open that can of worms in the next post! The long-awaited splashed white paper has now been published in PLoS Genetics. The full article can be read here. As a number of people predicted, the MITF gene is involved, but there are also some surprises. One of them is that the authors looked into the odd case of the Freiberger stallion, Apache. Above is his picture from the paper, and the link from his name will take you to a site with more pictures. His owners called his odd color and pattern “macchiato.” He’s been in my “mystery” files since I first stumbled across him a year or so ago, so I was tickled to see that he was included in the paper. It will take me a day or so, but I will try to put up a plain English summary of the paper. It is an exciting time for those of us interested in animal coloration!